UK Prime Minister Theresa May has said the EU must treat the UK with more "respect" in Brexit negotiations. In a statement at Downing Street she said for EU leaders to reject her plan with no alternative at this "late stage of negotiations" was "not acceptable". She said talks had reached an "impasse" and could only be unblocked with "serious engagement" from the EU side. European Council President Donald Tusk said a "compromise" was possible but the UK proposals had to be "reworked". What's behind Tusk's Instagram diplomacy? They want to avoid a hard border - physical infrastructure like cameras or guard posts - between Northern Ireland and the Irish Republic but cannot agree on how. Mrs May says her plan for the UK and EU to share a "common rulebook" for goods, but not services, is the only credible way to avoid a hard border. Speaking afterwards, Mr Tusk said that while there were some "positive elements" in Mrs May's proposals, EU leaders had agreed that "the suggested framework for economic co-operation will not work, not least because it is undermining the single market". In response to Mrs May's latest statement, he said the UK's stance at the summit "was surprisingly tough and, in fact, uncompromising" but that he remained "convinced that a compromise, good for all, is still possible". On Friday, the prime minister said: "Throughout this process, I have treated the EU with nothing but respect. The UK expects the same, a good relationship at the end of this process depends on it. A stern tone, strong words. But while there is no remote sign from the PM today that she is about to compromise, forces in the EU and in her own party are intent on forcing her to do so. Her problem is that they want to push her in different directions. Rhetoric doesn't change the fact that few of the players involved outside Number 10 believe that the suggestions the prime minister has put forward can be the ones that ultimately will win the day. She said the two sides were still "a long way apart" on two big issues: the post-Brexit economic relationship between the UK and EU, and the "backstop" for the Irish border, if there is a delay in implementing that relationship. The two options being offered by the EU for the long-term relationship - for the UK to stay in the European Economic Area and customs union or a basic free trade agreement - were not acceptable, she added. The first would "make a mockery of the referendum" she said, while the second would mean Northern Ireland would be "permanently separated economically from the rest of the UK by a border down the Irish Sea." Mrs May said no UK prime minister would ever agree to that: "If the EU believe I will, they are making a fundamental mistake." The prime minister attempted to reassure EU citizens living in the UK that, in the event no deal can be reached "your rights will be protected". She said "no-one wants a good deal more than me", adding: "But the EU should be clear: I will not overturn the result of the referendum. Nor will I break up my country." The BBC's Europe editor Katya Adler said EU diplomats did not consider that their officials working on Brexit negotiations had been disrespectful. They said they had listened to the UK position and are offering a unique partnership post-Brexit, but will not agree to anything that would harm the EU. She added that the prime minister's statement was being viewed in Brussels as a "tubthumper" designed to bolster her political position at home. 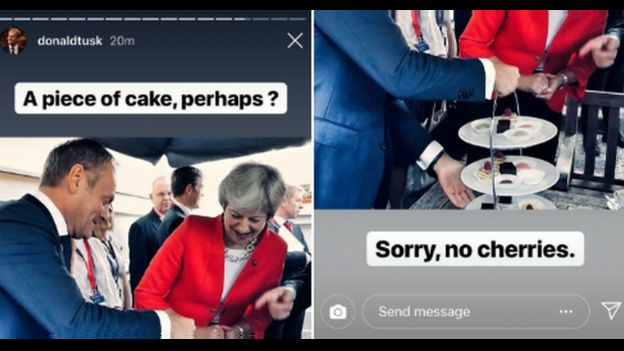 Mr Tusk followed up his remarks on Thursday by posting a photograph on Instagram of Mrs May and himself looking at cakes with the caption: "A piece of cake, perhaps? Sorry, no cherries." The EU has argued that the UK cannot "cherry-pick" elements from its rulebook. That was criticised by some Conservatives, including Brexiteer Iain Duncan Smith who described it as "quite insulting". Mr Tusk's team says the Instagram presence is aimed at reaching out to a younger audience. Labour leader Jeremy Corbyn said the prime minister's negotiating strategy "has been a disaster" and said "political games from both the EU and our government need to end" to avoid a no-deal scenario. "The Tories have spent more time arguing among themselves than negotiating with the EU. From day one, the prime minister has looked incapable of delivering a good Brexit deal for Britain," he said. Labour wants to see the UK join a customs union with the EU after Brexit, but remain outside of the single market. She added that the UK would "not countenance any new regulatory or customs barriers" between Northern Ireland and the rest of the UK. Leading Conservative Brexiteer Jacob Rees-Mogg welcomed the "strong and forthright" speech from the prime minister but said she should abandon her Chequers plan and come forward with a Canada-style free trade agreement. "This is the most realistic approach and similar to the EU's proposal." Scotland's First Minister Nicola Sturgeon said that while the EU position had been "bluntly expressed" it was not new - it was just that the prime minister "hasn't been listening". 1/ PM statement was dreadful. The EU view was bluntly expressed yesterday but not new - she just hasn’t been listening. If her tactic now is to double down on the Chequers dead duck, and then blame EU for a no deal, she will do huge damage to all those she is supposed to serve.